If you look at Uarch-Kaya massif from the road, you see right to left Сюрприз (Surprise), Карнавал (Carnaval), giant nail walls, and then Серпомпо (Serpompo). The deion of the approach to Serpompo is in the web, Shambala is situated а 10- 15 meters to the right. In the left part of the nail walls, there is a slanting, ascending right to left overgrown crack . belay with bolts. The belay is in 45 meters. Slab climbing along the crack, not difficult. Slope is 66 0. Approximately 5 а +. After the belays the route sharply turns to the right almost on 90 0, there are many cracks for nuts, slope is 55 0, 4 б.
R2 – R3. Climb 40 meters from the belays to the direction of a big tree, not long deviating to the right. The belay is 4- 6 meters lower and to the right from the tree. Climbing is approximately 4 б , slope 50-55 0. there are crack for any nuts. R3 – R4. Climbing upwards to the direction of the dry trees (6-7 trees). The belay is under it, 45 meter rope, slope 50 0. There are cracks. R4 - R5. From the belay traverse to the left and go upwards (course is approximately on 10 hours). From the belay a bolt on the slab is seen. Climbing 5 а on friction, there is a crack, bolt ladder and natural belay. The belay is to the left from a strong tree with trunk diameter approximately 180 mm. 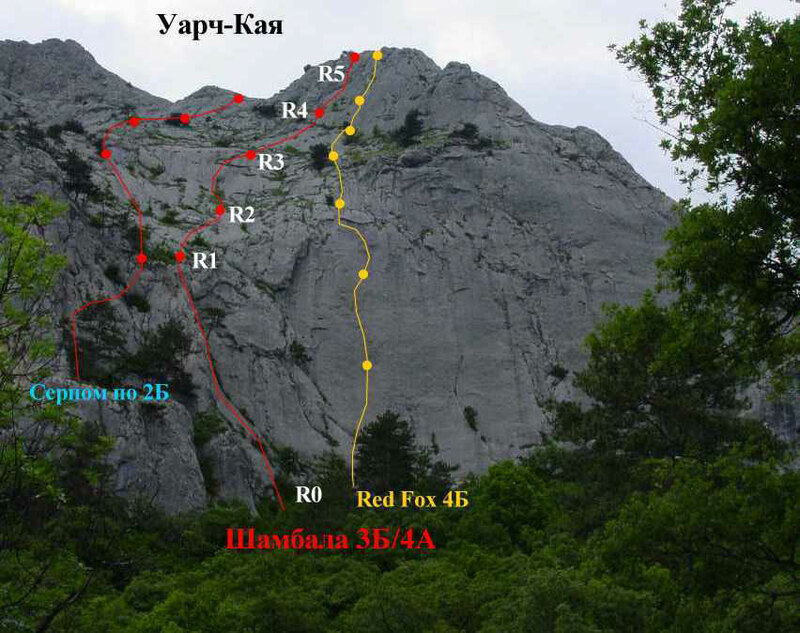 From R5 you can easily move to the last belay of Serpompo, or to have a full set of joy. From the belay go to the left and ascent till the bolts. The pitch is serious, it goes along the corner. Slope is 70-75 0, 5с. Bolt belay and natural one.